Amongst the presents I got as a kid would be “the one” that I kept asking for over and over and would always get. One year I asked for a radio controlled tank that shoots suction cup darts. I saw it demonstrated at a store with my mom and thought it was the best thing ever. I even asked Santa for it on some local public access TV show. I imagined all sorts of cool things I was going to do with it which always involved constructing some sort of tower of Legos and knocking it down with a dart while still sitting on the couch! I didn’t get it. I don’t remember what I must have gotten instead. I can only remember that little tank shaped hole in my heart. What gift did you ask for that Santa never delivered? Also, Biff is now available in ebook format! If you live in another country just do a search for “The Book of Biff” in your ebook store of choice to check it out! Obviously, Santa’s got a catapult because Santa’s dealt with Biff before. However, you really need a trebuchet to launch a car. Also, I would have appreciated you warned me earlier, I asked for (among other things) anvils, 1000 ton weights, cannon balls and bottles of nitroglycerin. A catapult, and now I know why I never got it. Biff is available in Amazon Kindle? I keep asking for this all my life, but I never got it. I never found a Brad Pitt under Christmas tree. I know it never come true, but I keep wishing. I’ll be sure not to ask Santa for my own house. Two things come to mind. One year I REEEEALLLLY wanted a NES, but was disappointed. On the other hand, though, the “big present” I did get that year, (Which oddly, came in a box of similar enough size and shape as the NES, thus raising false hopes) was an Air Raiders vehicle, “Thunderhammer”. (They were a mostly failed action figure line from the eighties.) It was actually pretty cool in that the vehicles all shot missiles via air pumps. I ended up getting a lot of play out of it, and might even still have some of the pieces. Actually, had the figures themselves been more than about 1/3 of an inch tall, it might have had more success. The second thing that comes to mind was all the years I asked for a “Q*Bert Flying Disc”. Thanks to Robert Zemeckis, I asked Santa for one off those long after I’d had reason to stop trying to catch him delivering presents on Christmas Eve. I now have book 1 on my iPhone, heehee. Had to rush to the online stores to check that out. water pistols. no matter if it was birthday (late spring / early summer), christmas or easter – “no kid, imagine if you shoot someones eye out?” – way to ruin childhood when everyone and their granny (!!) was running around with the fattest, most evil assortment of super soakers. Ahaha, now I can get my stepfather into Biff through the kindle he’s getting for Christmas! ALSO, IT IS CHRISTMAS EVE. YOU KNOW, THE EVE. OF CHRISTMAS. …somehow, I’m not that excited. Probably helps when you aren’t the child of the Grinch and that-guy-from-a-christmas-carol-that-says-bah-humbug. Yeah, I’m not that christmassy. Plus, I have a total of 0 (*ZERO*) presents. Hi I recently discovered Biff and am working my way through the archive. These comics are the best I’ve read in a long time. An Arabian horse (never a pony). I must have asked for a horse every time I got to the fat guy, from about age five to … well, I think I was eleven before I was “too old” to sit in his lap at the mall. I wrote him, though, until I was fifteen, still asking for a horse. The closest I ever got was toy horses. That fifteenth Christmas, when I didn’t find a horse outside in the yard, Mom suggested that Santa might bring me a horse if I set up to receive one. I learned very quickly how expensive it was going to be to rent a stable stall and how much feed would cost. After that fifteenth Christmas, I quit asking for a horse. You SERIOUSLY got the “you might shoot someone’s eye out” explanation for WATER PISTOLS? Good Lord! Unless your parents really thought eyes were made out of tissue paper, they should have done better than that! Hooray. It’s exciting to see biff in glorious shades of grey on my kindle. I’m still telling myself that one day I’ll order the physical copies, but this is a good start! Merry Christmas Biff and Chris. Well, a few years I did wish/ask for Santa to bring more RAM for my computer…I quickly learned that Santa is not up with all this ‘technology’ stuff. Although this year I did wish for Borderlands…and discovered that Santa doesn’t realise that Steam sends gifts instantly. Two months early, but I’m not complaining! I remember my reaction upon first finding Biff was to read through all of them, and then being disappointed when I discovered I’d read them all and would then have to wait for the next one. The thing I would ask for every year was a telescope, but alas, I still don’t have one. This year, however, I’m buying a telescope with my Christmas money. 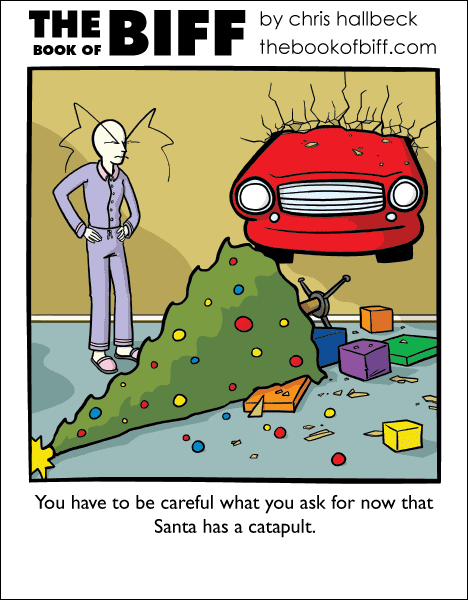 Now I want both a catapult and a trebuchet for Christmas. Incentive to buy a car and finally take driving lessons has arrived! Illw ant a Model T- a Ford Hudson, a Tonka Dump Drunk, a Humvee…. I almost forgot, I hope I’m in time. It’s Boxing day here at 5:47PM, so that means (hoping you’re in Central Time), it’s about 10:00PM on Christmas there? Anyway – have a very merry Christmas! Happy Holidays! Now there was a time when i wanted a “The Bear in the Big Blue House” Small plastic doll house, which came with a figure of the big Blue bear. Now because my mum thought that the item was something it wasnt, cant remember what, she got me regular dolls furniture for the good old wood dollhouse. My ungranted Christmas wish? Well, I’ve been disappointed so many times. Even though I’m 23, I still do childish things. I wanted to tell Santa my wishlist, all of the items were available at the Pokemon Center kiosk in the adjacent area near Santa’s Workshop. I wanted plushies of the legendary Pokemon from Generation II and IV (yes, I’m a fan of Pokemon and to assert that to keep fans coming back, if you are trying to keep fans, you MUST add new characters in order to keep the fire alive). But, when I finally decided to tell Santa, the line was backed up from the center of the heart of the mall to doors leading to the outside shopping area and that was about 3 store away from Santa’s Workshop. So yes, my wish to tell him was strong enough to brave bone-soaking rain, but it buckled and fell when I saw the line. I like telling my life story to the men who play Santa every year. Then again, I count my age by months (I’m 278 months old). I want a trebuchet I can use to launch my catapult.